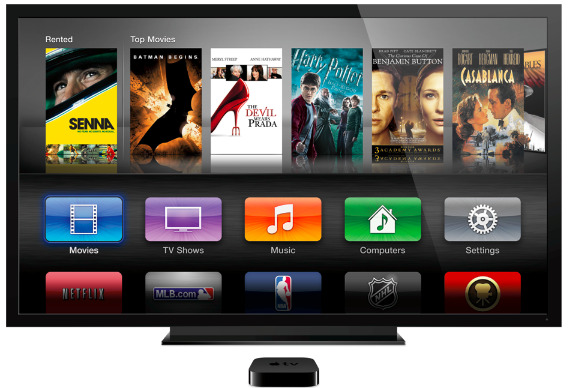 iOS 6.1’s Monday release may capture most of day’s attention, but Apple’s favorite hobby got a little love as well with the release of Apple TV Software Update 5.2. The set-top box gains a variety of new features related to iTunes in the Cloud, Bluetooth keyboard support, AirPlay sending, and more. The new iTunes in the Cloud support means that you can browse and stream iTunes-purchased music from iCloud, without needing to stream it from another computer on your network. And this feature works even for customers without iTunes Match. The new Bluetooth keyboard support allows you to pair your wireless keyboard with the Apple TV, thereby simplifying the process of entering text into search boxes, password fields, and the like. You can pair the keyboard under Settings > General > Bluetooth, as Apple explains in this new support document. Though Apple TV has long been able to receive AirPlay audio and video, it now gains the ability to send AirPlay audio as well. You can send the audio from movies, TV shows, and other content you play back on Apple TV to AirPlay-enabled speakers and devices including the AirPort Express and other Apple TVs. You can insert your own Apple TV singularity or Inception joke here, as desired. Finally, Apple says that the 5.2 update addresses performance and stability improvements with the iTunes Store, AirPlay, Netflix, iTunes Match, and wired ethernet connections. The update addresses a pair of security vulnerabilities as well. You can install the update directly from your Apple TV.